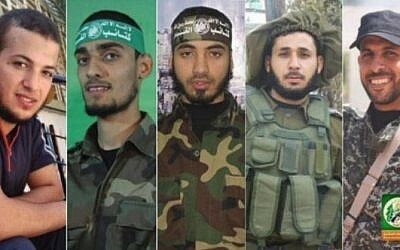 Earlier on Saturday, Hamas publicly acknowledged that five members of its military wing, the Izz ad-Din al-Qassam Brigades, were among the fatalities. The army did not provide evidence for its identifications. Most could be independently verified with photographic evidence of the operatives wearing uniforms or receiving a military-style funeral from the terror group in question. Others could not be immediately substantiated. At least one appears to be partially incorrect. 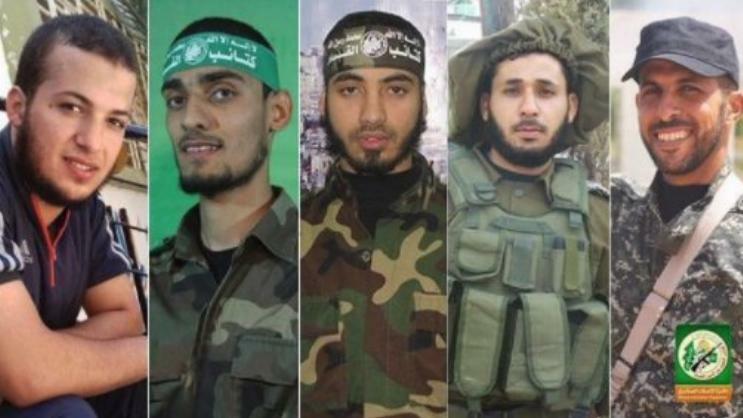 The IDF identified one of the two Hamas members who shot at Israeli soldiers on Friday evening and attempted to breach the security fence, before they were shot dead, as 23-year-old Mussa’b al-Saloul. 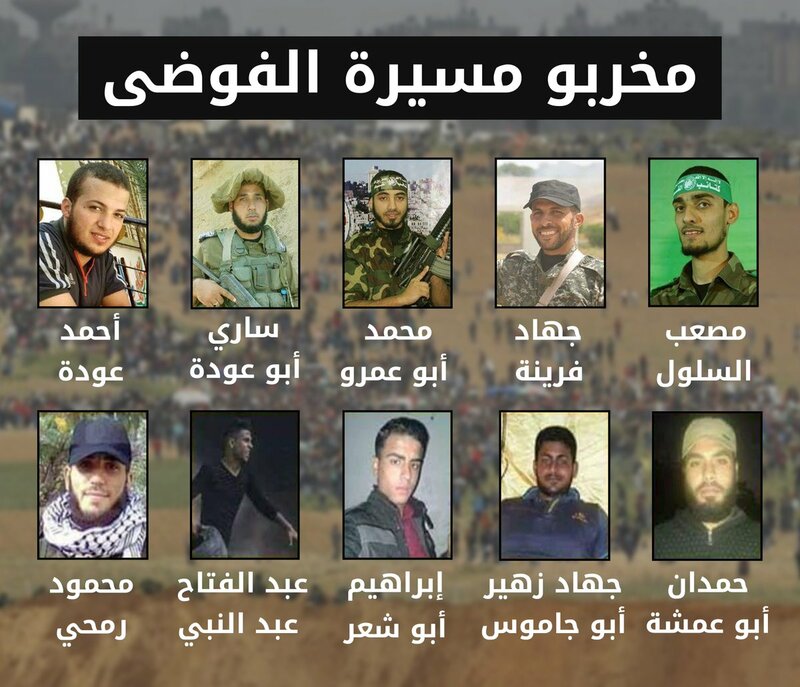 Gaza’s Hamas terrorist rulers released these images of members of its military wing who it acknowledged were among 15 Gazans it said were killed by Israeli fire during clashes along the security fence on Friday, March 30, 2018. Palestinian media reported that the bodies of the two gunmen were captured by Israeli soldiers. The IDF would not officially comment on this claim. The oldest operative identified was Jihad Farina, 35, a company commander in Hamas’s military wing; the youngest was 19-year-old Ahmad Odeh, who served in the terror group’s Shati Battalion, the army said. 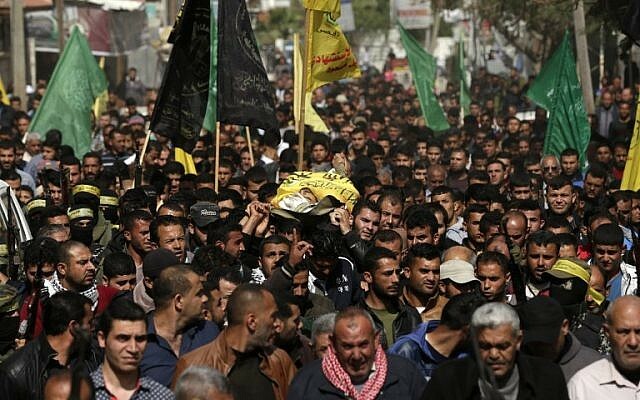 Thousands attended funerals in Gaza Saturday for 14 of those killed — two were buried on Friday — with mourners holding Palestinian flags and some chanting “revenge” and firing into the air. “Where are you, Arabs? Where are you, Muslims?” mourners chanted at one funeral, calling on the Arab and Muslim world to intervene. 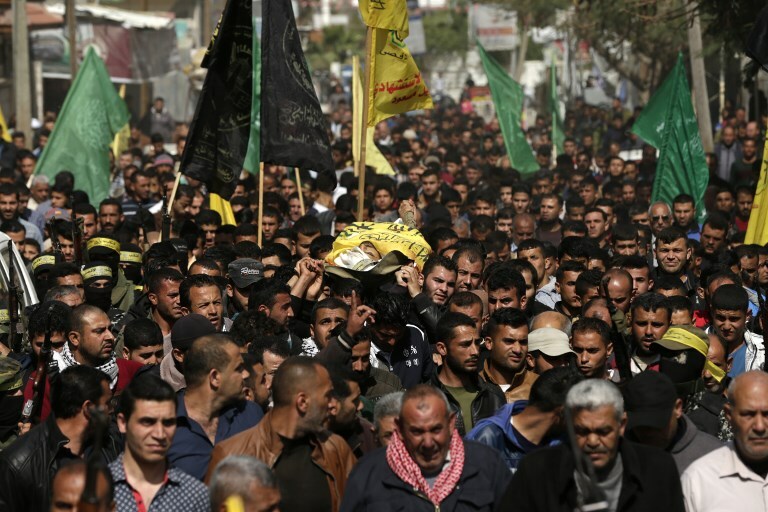 A general strike was held in both the Gaza Strip and the West Bank. IDF Spokesman Brig. Gen. Ronen Manelis said on Saturday that all those killed were engaged in violence, adding that Gaza health officials exaggerated the number of those wounded and that several dozen at most were injured by live fire while the rest were merely shaken up by tear gas and other riot dispersal means. Manelis said on Friday evening that the army had faced “a violent, terrorist demonstration at six points” along the fence. 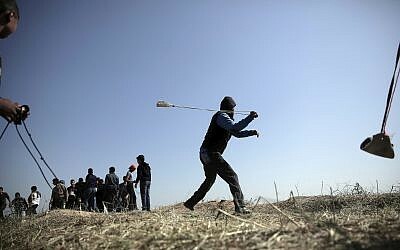 He said the IDF used “pinpoint fire” wherever there were attempts to breach or damage the security fence. “All the fatalities were aged 18-30, several of the fatalities were known to us, and at least two of them were members of Hamas commando forces,” he said. 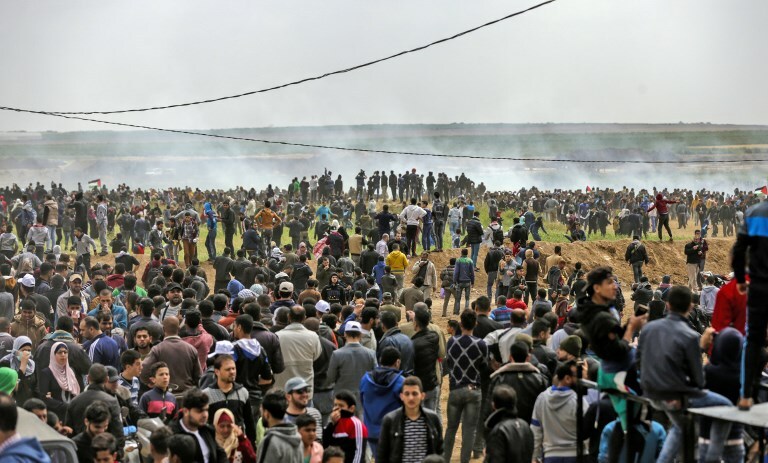 The death toll from Friday’s protest was provided by the Hamas-run Gaza Health Ministry, which also added that some 1,400 Palestinians were injured during the protests, over half by live rounds. Israeli authorities have no way to independently confirm the casualty reports. Manelis warned Saturday that if violence drags on along the Gaza border, Israel will expand its reaction to strike the terrorists behind it. The military has thus far restricted its response to those trying to breach its border, but if attacks continue it will go after terrorists “in other places, too,” he said. He said that Hamas and other Gaza terror groups were using protests as a cover for staging attacks. If violence continues, “we will not be able to continue limiting our activity to the fence area and will act against these terror organizations in other places too,” he said. 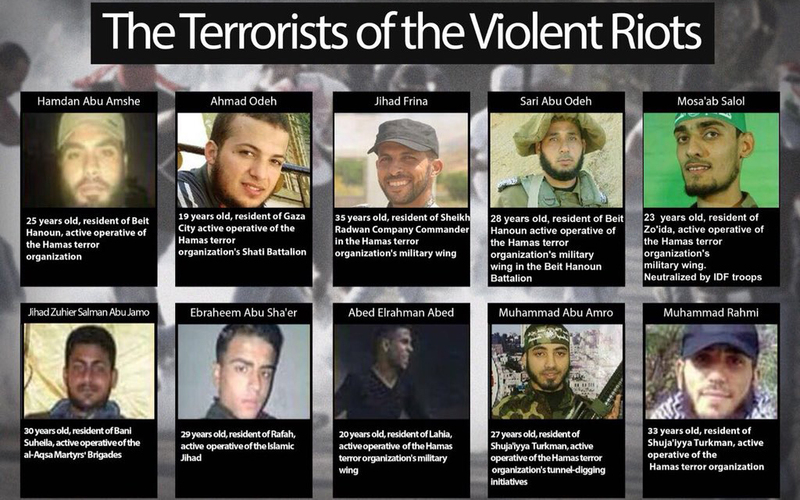 Hamas is an Islamist terror group that seeks to destroy Israel. 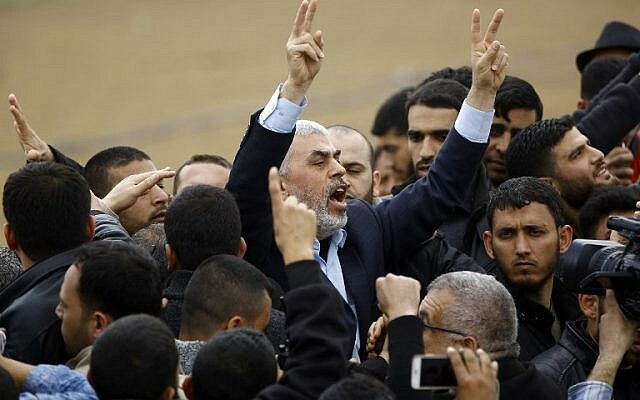 It seized control of Gaza from Mahmoud Abbas’s Fatah in a violent coup in 2007. The army has remained on high alert even as the violence appeared to abate Friday evening, amid fears of persisting attacks, including infiltration attempts and rocket fire. Protest organizers have said mass marches would continue until May 15, the 70th anniversary of the establishment of the State of Israel. Palestinians mark that date as their “nakba,” or catastrophe, when hundreds of thousands left or were forced to leave during the 1948 War of Independence. The vast majority of Gaza’s two million people are their descendants.